Product #3606 | SKU FR2D | 0.0 (no ratings yet) Thanks for your rating! 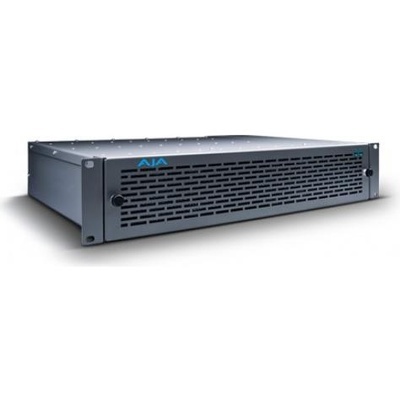 The FR1 and FR2 mounting frames provide high-density rackmount solutions for AJA's R-Series modules. The FR1 is a 1 RU frame with 4 slots; the FR2 is a 2 RU frame with 10 slots. Both frames feature high-capacity power supplies with no power restrictions for any module combination. Also, both frames feature multi-fan forced-air cooling, which provides ample cooling capacity without the need for an empty rack space above the units. Both frames feature optional redundant power supplies - the FR2's power supplies are easily changed from the front of the unit. Also, both the FR1 and FR2 feature a frame color black reference input that is distributed to all slots.